Traveling by air can be very stressful. As a passenger, you always expect the worst to happen because we have to admit, sometimes we sit beside a ‘not-so-nice’ passenger, or a child can go ballistic during the flight, or sometimes, it can be delayed which is enough to keep other passengers’ blood boiling in anger no matter what the reason is. The crew is well-trained to handle this kind of situations. They make sure that everyone knows what’s happening and that each passenger is as comfortable as possible. But this crew went above and beyond to ensure that one passenger is well taken cared of. This caught the attention of one passenger who decided to share this interesting experience online. Kristen Wiley is sitting on a plane at the Seattle-Tacoma airport and the Alaska Airlines Flight 748 was about to take off. However, something was going on and this delayed the flight for 45 minutes! This poor woman was very confused and she had no idea where she was or why she was on the plane. She was so scared and only some of the passengers are able to witness the entire situation because of the guard who crouched down the aisle to do something amazing. This woman has a dog with her and she found support in her pet as she started cuddling has while trying to figure out the situation. Individuals who have this condition never have it easy because they never know what the future holds for them. 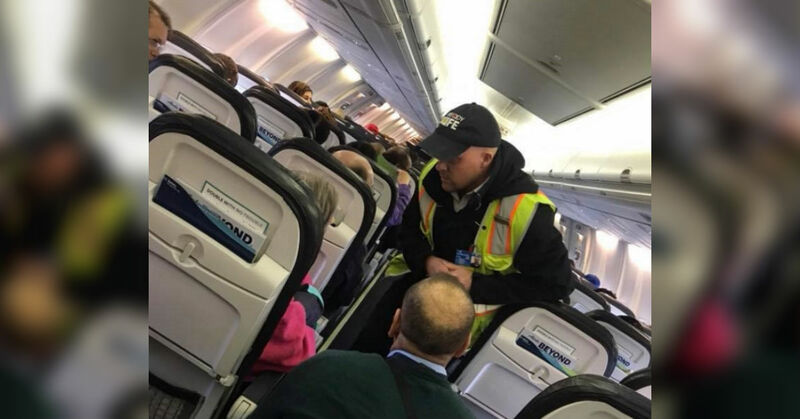 According to the post, one of the Alaska Airlines staff was very passionate and patient towards this passenger. He was explaining every step, cuddling her dog, while working with her husband or caregiver to find the best solution. So instead of getting furious about the delayed flight, she was happy that this kind of person still exists in this world. Showing compassion for other people and Kristen is one of the witnesses at how this woman was treated by the airline company’s employees. The crew members were able to eventually come up with a solution and the woman finally calmed down. They, later on, learned that the woman, her dog, together with her husband was escorted off the plane and explained to the passengers why they did it. The woman just needed to take her time before she can fly again. She felt too stressed and pressured because of this trip so the company made a very generous offer. The airline company offered hotel and transportation with plans to rest up and try to fly again the next day. This story should remind us that no matter what the situation is, to never hesitate to lend a helping hand and to never judge a situation right away.